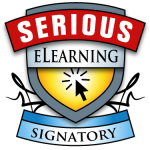 Four of our renounced thought leaders (Michael Allen, Julie Dirksen, Clark Quinn and Will Thalheimer) launched the serious eLearning manifesto at March 13. They believe that we should do a better job with eLearning and that we should create learning experiences that are effective, that improve performance and that live up to the expectations we all (should) have of eLearning. They wrote down 22 principles. If you apply them correctly, your eLearning will be up to standard. This initiative is well received but when I speak to people about it I get two questions: “Great, but how do I use these principles” and “How do I convince my boss or client that we should apply them.” This sparked the idea to write a post on each of these principles, with my answer to these two questions on each principle. I will write a post each week over the next few months. I do hope to get support from you. Please sent your ideas, comments, best practices and whatever you can think of to mail@kasperspiro.com or put a comment on this page on at the article. If it adds value I will include them in the posts. If you sent me something on a topic already covered I will update that post. I will publish all post separately at this blog, but this page will act as the main page for all posts. Over the next 22 weeks this list below will get more and more hyperlinks.